Starting to see lots of beaming children clad in colorful kimono (girls) or hakama (boys), often clutching sticks of red and white candy, wandering around shrines and temples? Is it late October to mid-November? If so, then it must be “Shichi-Go-San” – a very special time for children and parents in Japan. “Shichi-Go-San” may seem like a coming-of-age ceremony, and in a sense it is, but more so, it is an event celebrates children reaching important social milestones in their lives and one that offers thanks to the gods for their health and growth. 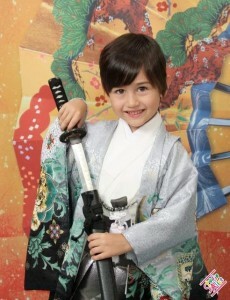 “Shichi-Go-San” is celebrated by three year-old boys and girls, five year-old boys, and seven year-old girls. Kami-Oki: During the Heian period (794-1195), on the seventh day after their birth, both boys and girls had their heads shaved and were kept that way until they turned three. After that time, they were allowed to grow their hair out and celebrated “Hair Arrangement” (Kami-Oki) on Shichi-Go-San of their third year. Hakama-gi: Boys were fitted with their first hakama (long flowing trousers worn over kimono) during their fifth year Shichi-Go-San. Obi-toki: For the Shichi-Go-San of their seventh year, girls began to use an obi (sash/belt) that was the same width as an adult’s to tie their kimono rather than the thin cord that they had used up until this time. Although these ceremonies may appear to be simply social and cultural milestones, they are actually very closely tied to the high infant mortality rates in feudal Japan. During the Edo period (1603-1868), it was estimated that the infant mortality rate was as high as 50% with the cause of death in most cases being infectious disease such as small pox and measles. Even those families with the very highest standards of living and access to sufficient nutrition did not escape this fact of life: the 11th Tokugawa Shogun, Ienari, had 55 children. Of these, only four reached the age of 40. Only 21 lived past 15, and 32 (62%) passed away before the age of two. Due to these severe conditions, as much as children were loved and cared for, it was recognized that they might not survive and so the Japanese of the Edo period had a saying: “Nana-sai made ha, Kami no uchi” (Children belong to the gods until the age of seven). Until a child reached the age of seven, they were considered to have a foot in both worlds and their lives on this earth had not fully taken root. Once they reached their seventh birthday, children became “ichinin-mae” (adults) and joined the ranks of the rest of human society. They were also entered into the local family registers at this time. From this one can see why these ages were important turning points in the life, growth, and development of children and why they became celebrated social events. However, why the difference for five year-old boys and seven year-old girls? Although it is said that Shichi-Go-San started in the middle of the Heian period by court nobility, Shichi-Go-San as it is known and celebrated today in Japan has its roots in the Edo period (1603-1868). Tokugawa Iemitsu, the third Tokugawa Shogun, was concerned for the health of his fourth son, the sickly Tokumatsu (who would later grow up to be the fifth Tokugawa Shogun, Tsunayoshi), and so went to pray for Tokumatsu’s health on November 15th of the boy’s fifth year. But why November 15th? According to Shinto tradition, all eight million gods of Japan leave their shrines and go to Izumo Taisha in the tenth month of the year – “Kannazuki” (神無月, “the month of the gods”). When this tenth month of the lunar calendar is converted to the Gregorian calendar, it generally overlaps the month we call November. Also under the lunar calendar, the 15th day of the month was the “kishukubi” – the “day that demons don’t go out” and so anything done or undertaken on this day is bound to meet with good fortune. It wasn’t until the Meiji period (1868-1912) that the celebrations known as Shichi-Go-San came to be called such, and it wasn’t until the following Taisho period (1912-1925) that Shichi-Go-San came to be celebrated as it is today all over Japan, with children getting dressed up and going with their parents to nearby shrines to offer their prayers to the gods. Modern Japan has offered another innovation to the celebration – photo studios offer Shichi-Go-San packages where a huge variety of kimono and hakama (many with some very distinctly non-traditional patterns and designs!) can be combined with additional photos in Western costumes such as pirates, cavaliers, or even Buzz Lightyear from Toy Story fame. 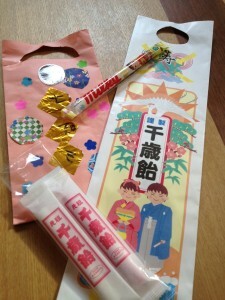 Adding to the festive atmosphere for the kids is a special Shichi-Go-San treat: chitose ame (millennium candy). As so much with Shichi-Go-San as is it known today, this long – some times as much as a meter! – thin candy, too, got its start in the Edo period. Between 1688-1711, there was a sweet vendor named Shichibei in Asakusa. He created a candy and gave it the lucky sounding name of “thousand year candy” and sold it at Sensoji. The candy became a huge hit and became popular throughout the nation. Chitose ame is red and white – two colors associated with auspicious occasions – and its long length is symbolic of bringing long life to children. It is usually sold in long, thin bags with cranes and turtles (symbols of longevity) as well as the lucky, felicitous combination of shouchikubai (pine, bamboo, and plum) drawn on them. Some celebrate when the child is a year younger (i.e., two rather than three), as a result of using “kazue-doshi” – when born, a child is considered a year old, and hence a two year-old has a “year” added to his or her age. There is also a theory that says that it was the fifth Shogun, Tsunayoshi, who went to pray for his eldest son’s (also named Tokumatsu) health, but given that this Tokumatsu died when he was five, it is unlikely that this theory is accurate. Although this is written with the kanji 「無」 “no/not”, this is likely an ateji – phonetic equivalent substitute character – and is actually a possessive particle.